This is the fastest dessert recipe we know. It’s perfect when you find out at the last minute that you need to bring a dessert to dinner. How about when your kid needs something for school the next morning and it’s 9 o’clock at night? This will do the trick. The recipe calls it a bar, but we think of it more as a shortbread cookie. Because it is like shortbread, the dough is not the same consistency as a regular drop cookie. The success of this dough is all in your hands. This dough needs to be pressed into the pan with your hands. It is also best to start mixing it with your hands when you start to add the flour. Another tip–start with super softened butter. If you do, you can mix all the ingredients together in one bowl and a wooden spoon. What you get at the end is a toffee-like cookie/bar thanks to the butter and brown sugar with the gooey goodness of the chocolate chips. There is no one in the room that can resist this dessert. It’s salty and sweet goodness is a hit with everyone. Preheat the oven to 350 degrees. Butter a 9 x 13-inch glass baking dish. In a large bowl, beat together the butter, sugar, salt, and vanilla. Add the flour and mix well to combine. 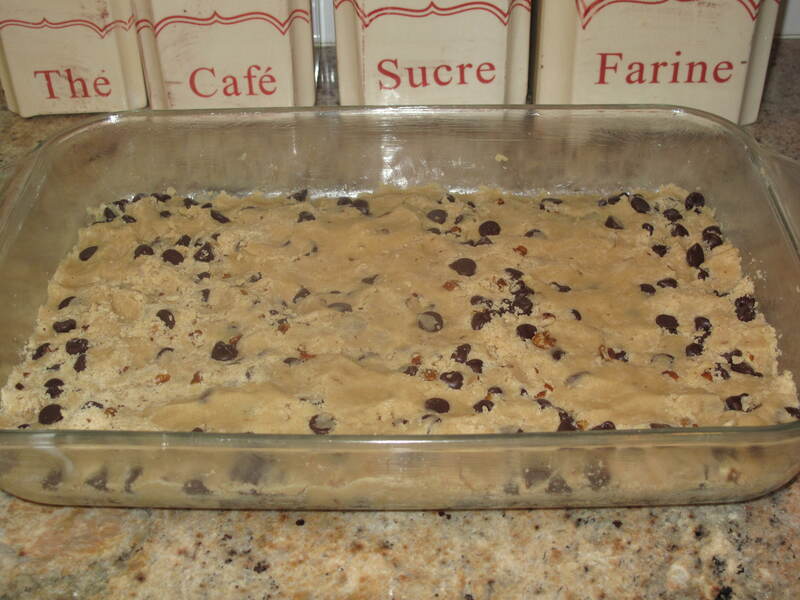 Stir in the walnuts and chocolate chips. Bake until golden and set, about 20 minutes. Cut into even squares while still warm. Fast and fabulous. We made this over Memorial Day weekend for a party that we went to and they were an absolute hit. Give these a try the next time you want something delicious and don’t have a lot of time. Let us know too if you think they are a cookie or a bar. We can’t ever seem to decide. What are your favorite quick desserts? This entry was posted in Food and tagged Acorns, Baking, Blog, Cooking, Family, Food, Fun, Life, Love, My Life, Photos, Recipes. Bookmark the permalink. Those look great. I thought schools had banned most sweets. I don’t have a dog in that hunt, but figured parents might welcome that. Quick desserts. When Katherine realizes we don’t have dessert for guests (which is rare), she’ll make chocolate chip cookies or brownies. For us if we have nothing, zabaglione hits the spot. Hi Rufus’. My niece and nephew always seem to need food for bake sales. This recipe fits that bill. 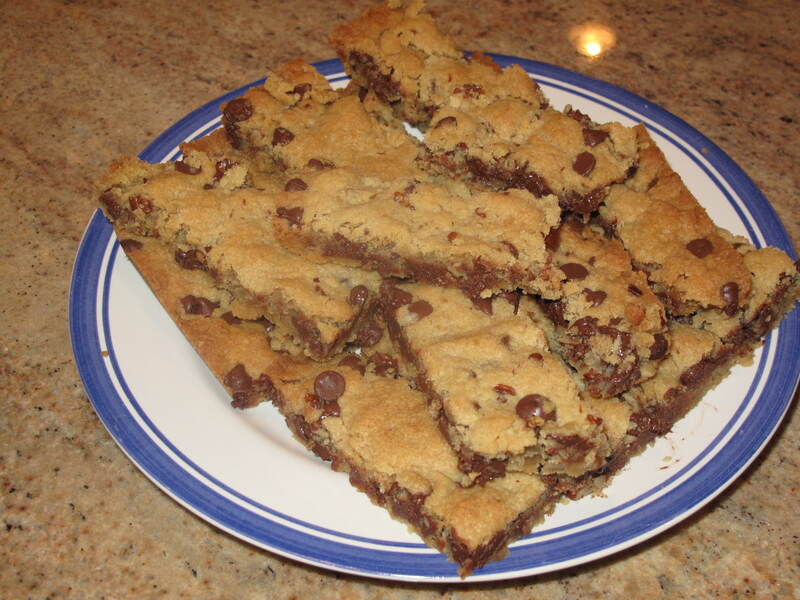 As for your desserts, nothing beats a chocolate chip cookie or a brownie. Zabaglione….not sure I’ve ever heard of that. Is that a recipe you’ll be posting or have posted. Talk to you later. Easy way to use up egg yolks. And you only need three ingredients for the basic one. Chocolate: http://rufusguide.wordpress.com/2011/04/14/chocolate-zabaglione/ … or the more standard one … http://rufusguide.wordpress.com/2011/03/14/mixed-berry-zabaglione/. Sounds great. I’ll have to give it a try. Oh my gosh…Im not sure if these would make it out of my house for school!! Hi Casey. Welcome to Acorns On Glen. These are pretty good. Again, not really a bar; not really a cookie. Give them a try and let us know what you think. Come back and visit us soon and often. Is this the same desert (cookie and/or bar) when I was at your house. If it is, let me tell everyone they are delious. Hi Carolkin. It was the same one.